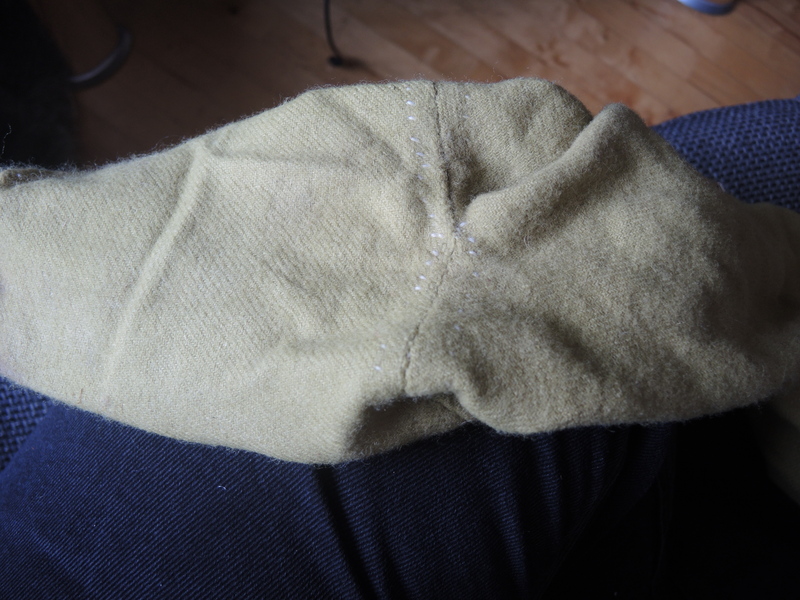 For the hosen/trousers I still had a great piece of wool twill, plant dyed in reseda and iron-sulfate by Firiel in a gorgeous light green. Exactly the right amount, I only left some small scraps. For the reconstruction I used a whole bunch of different original pictures and findings from which I incorporated different attributes. Most of the findings are from Herjolfsnes though. For the reconstruction I took a piece of cheap fabric which I stitched right to his leg (or rather around it), trying to avoid any folds or wrinkles. 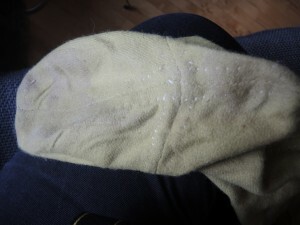 I then cut the fabric without seam alowwance and used it as a pattern for the wool. I laid the pattern out diagonally on the wool and cut it out including seam allowance. For the part of the foot, I sumply took the rest of the wool, sewed it directly “on” the foot and followed the rough stitches with finer seams. 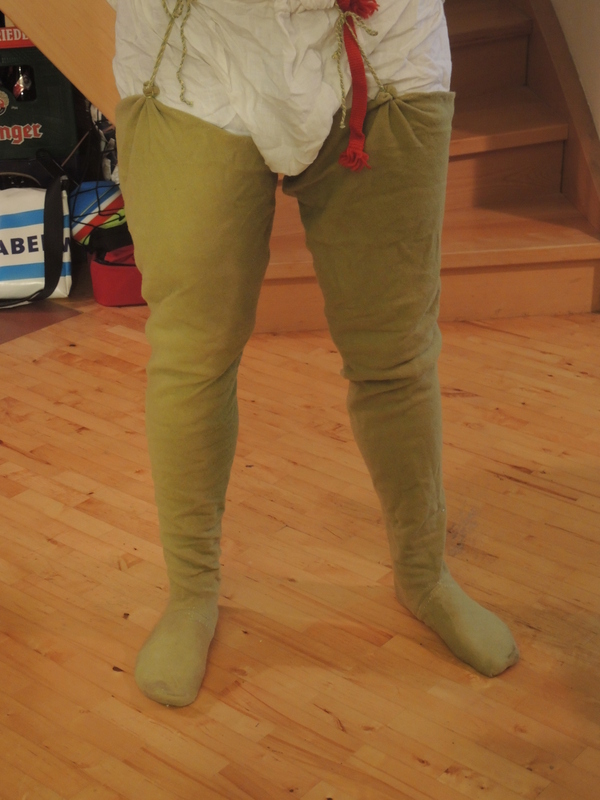 The hosen are fitting perfectly and give some leeway since he is supposed to work in his clothes. I really was not sure about the attatchement of the strings holding the hosen up. Does anyone know the findings more in detail and can tell me if wholes have been found in the upper parts? I do know that 15 century original pictures show them but many findings look as though they had no attatchement at all. How do they stay up? Interesting are other pictures which show a kind of knot or tommy in the fabric as in Anatomia of Guy de Vigeganot, in which the fabric seems to be knotted to the strings directly, a solution which also can be seen on the Bocksten man bog. This stays up well all day long so I just left it like that for the meantime.